"They have podracing on Malastare. Very fast, very dangerous." 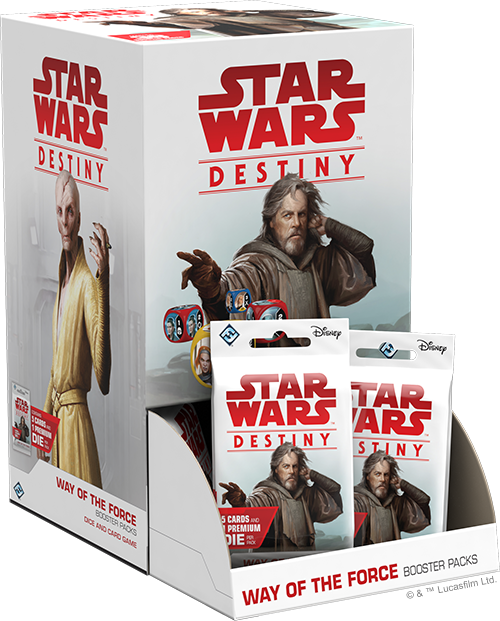 Order your own copy of Way of the Force Booster Packs at your local retailer or online through our website today! On the remote planet of Tatooine, danger lurks around every corner. Rogue sandstorms, Tusken Raiders, and more make living on this Outer Rim planet a threatening challenge. Some take this to an extreme degree, risking their lives in one of the most dangerous activities in the galaxy: podracing. 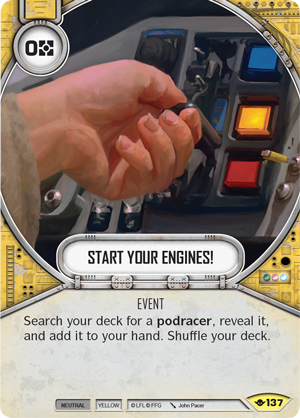 Join us today as we preview the impact of podracers in Way of the Force, a new set of boosters for Star Wars: Destiny. 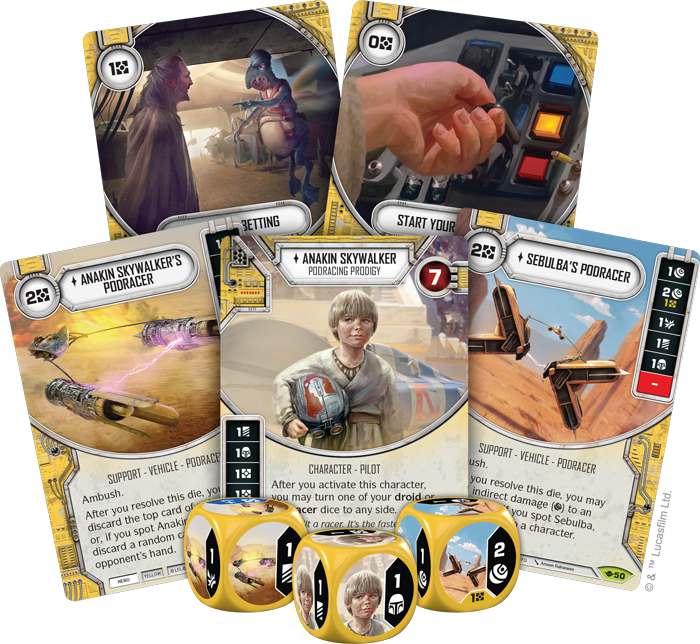 Way of the Force introduces 160 brand-new cards that enhance existing strategies while introducing powerful new sub-themes like podracing. Way of the Force provides players with new ways to think about deckbuilding in Star Wars: Destiny. One of the main ways to accomplish this is through expanding on plots. First introduced in the Legacies booster packs, plot cards traditionally had their effect at the start of the game, having no further impact on gameplay after that point. 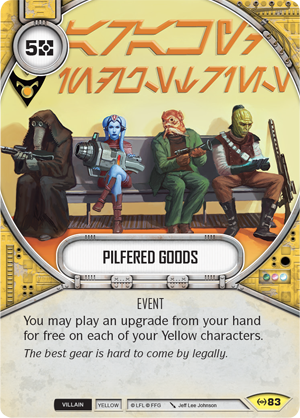 Way of the Force changes this, introducing plot cards that can help define your entire game plan. Perhaps the greatest representation of this is the Boonta Eve Classic (Way of the Force, 155) itself. 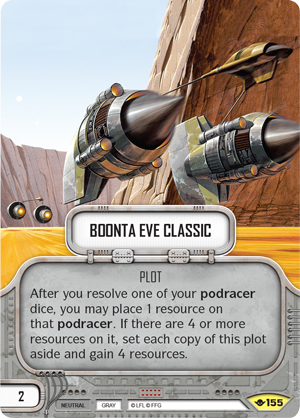 The Boonta Eve Classic takes up two points for your team, and allows you to place a resource on a podracer after you resolve its die. Then, if there are four or more resources on that podracer, you may set each copy of Boonta Eve Classic aside, out of play, and gain four resources! In other words, winning the Boonta Eve Classic offers a windfall of resources that can be used to help defeat your opponent. Cards like Pilfered Goods (Empire at War, 83) are much easier to play when you’re a Boonta Eve Classic champion. But you’re not winning the big race without a podracer, and heroes and villains alike have options for both racers and pilots to field. Sebulba always wins. It’s just a fact: not only is he one of the most skilled racers in the galaxy, he’s not afraid to fight dirty to ensure a victory. 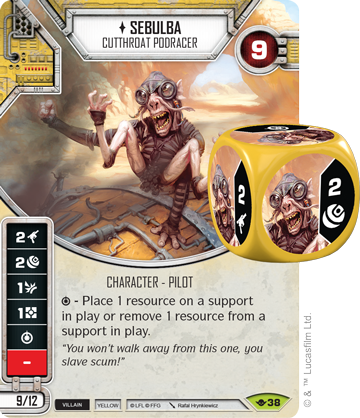 At nine points for a normal version or twelve for an elite Sebulba, Cutthroat Racer (Way of the Force, 38) is your best bet to win any race. 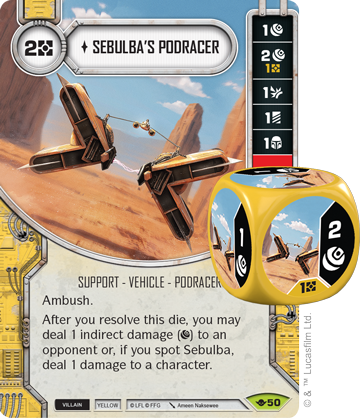 With two sides of his die showing damage, Sebulba can hit your opponent where it hurts, but he truly shines when paired with the Boonta Eve Classic. His special die symbol lets you place a resource on a support, getting you even closer to the four-resource windfall of the Boonta Eve Classic if you choose to place the resource on a podracer. Conversely, he can also remove a resource from a support, sabotaging any opponent who may be trying to win the big race. A pilot is only as good as his racer though, and Sebulba's Podracer (Way of the Force, 50) is a top-of-the-line model. As a two cost vehicle with ambush, this podracer is easy to field, and it can help you win the Boonta Eve Classic while damaging your opponent’s characters. Every time you resolve Sebulba’s Podracer’s die, you deal one indirect damage to an opponent. Or, if you can spot Sebulba himself among your team, you choose a character to deal one damage to, narrowing your target. With two sides already showing indirect damage, Sebulba’s Podracer is surprisingly damaging, and it can help defeat characters even if you aren’t running the Boonta Eve Classic plot. Before he was Darth Vader—before he was even an ambitious Jedi—Anakin Skywalker was a podracing prodigy. In Star Wars: Destiny, young Anakin Skywalker (Way of the Force, 88) is a perfect support character if you're trying to win the race. With three sides of his die giving you a resource, Anakin Skywalker can help you build to something greater, especially if you put him in the driver's seat of a podracer. 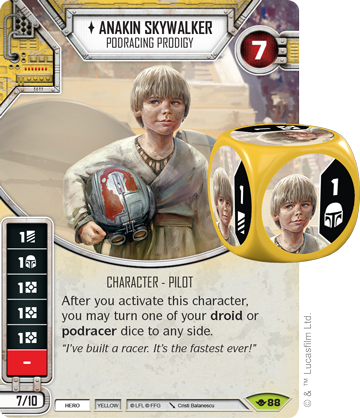 After you activate Anakin, you may turn one of your droid or podracer dice to any side, manipulating the very dice on the field to help you win the big race. Just of the cards that Anakin can manipulate after is his own Podracer (Way of the Force, 102). Not only can Anakin ensure that his Podracer’s die is showing the result you want, but you also get to discard a random card from an opponent’s hand if you can spot Anakin Skywalker. Or, if Anakin isn't piloting or if you’d prefer this effect, you may choose to turn the Podracer into a mill machine and discard the top card of a deck. Either way, Anakin Skywalker and his Podracer are a great support team that builds your advantage. While racers and their pods are the focus of the race, there's plenty that goes into preparing for the Boonta Eve Classic. It would be embarrassing to show up to such a historic race without a proper racer, luckily, Start Your Engines! (Way of the Force, 137 ) ensures you’ll have a podracer on the field as quickly as possible. Start Your Engines! 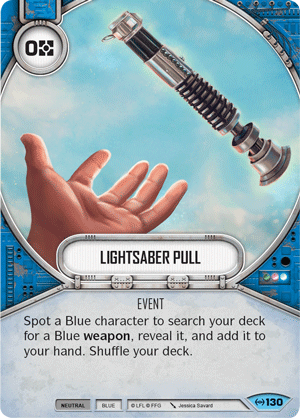 joins Lightsaber Pull (Empire at War, 130) as one of the few cards that lets you search your deck for the tools you need, and it lets you start racing (and winning) the Boonta Eve Classic as quickly as possible. You don't just want to win the race—you'll want to make a little profit on the side. 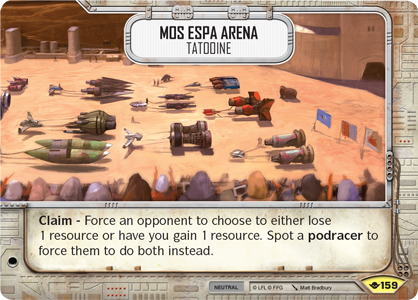 Podracer Betting (Way of the Force, 134) lets you gain resources… if you’re feeling lucky. 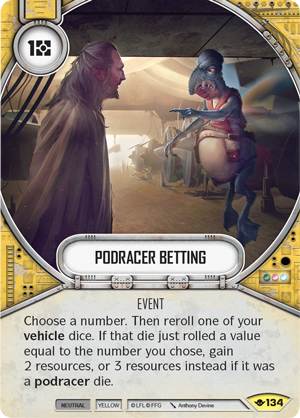 This event lets you choose a number and roll a vehicle die, if you roll a value equal to the number that you chose, you'll gain two resources, or three if the vehicle you chose was a podracer. Because Podracer Betting costs a resource to play, you're taking a risk and making an investment. 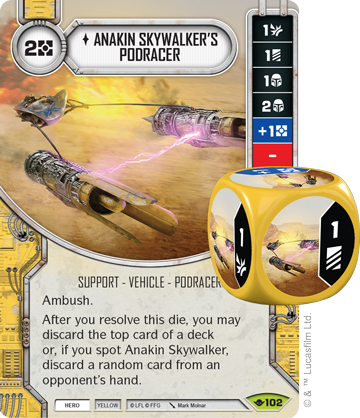 Still, if you're betting on Anakin Skywalker or Sebulba’s Podracer, the odds are in your favor, with four of each die showing a value of one. Finally, there is the course itself. The Mos Espa Arena (Way of the Force, 159) is the epicenter of excitement on Tatooine. The roar of the podracers fills the entire arena and makes it the perfect battlefield for your high-speed deck. When claimed, Mos Espa Arena allows you to either gain one resource, or force your opponent to lose one resource. And, if you spot a podracer, you may resolve both effects, giving you a massive swing in resources! If your deck is focused on podracers, this battlefield can keep your resources stocked while ensuring your opponent doesn’t have the tools to take you down in the big race. Star Wars: Destiny is focused on the epic battles between Star Wars characters, but not all battles are fought with weapons. High-speed podracing can be just as dangerous as a lightsaber duel, and even more rewarding if you manage to survive. Do you have what it takes to survive one of the most dangerous races in the galaxy? Get to the finish line first with Way of the Force (SWD12), available now for pre-order from your local retailer or our website!